Editor's Note: This book review was originally published in the Q3 2014 issue of AECbytes Magazine and is being republished as it still very applicable and relevant today. We still haven't seemed to have made much progress in applying BIM in the operations and maintenance phase of a building's lifecycle, a topic that AECbytes will explore in more detail going forward. Taking a look back at this seminal book, which still seems to be the only one on the topic, seems like a good way to start. The book BIM for Facility Managers was published last year, yet it remains the only book on the topic of BIM in FM, despite the fact that the topic is of vital importance, not just to the professionals working in the AEC/FM industries, but the vast majority of human beings who inhabit some kind of building structure practically every minute of their lives. Who wouldn’t like their buildings to be smarter, more responsive, better maintained and easier to fix when something breaks down? While there are already initiatives by leading technology companies like Intel and Cisco to make homes smarter and more connected—commonly popularized by the term “Internet of Things”—the only way to achieve this effectively is to start at the beginning, when buildings are designed and built, and let their intelligent underpinnings run through to their operations and maintenance. Fortunately, BIM (building information modeling) is here and has made significant inroads in the design and construction phase of a building. It is universally acknowledged by AEC firms as the go-to technology for their current and future projects and there is a whole plethora of BIM authoring tools, add-ons, plug-ins, books, articles, training, and other resources for AEC professionals to rely on as they make the transition from the old 2D-centric CAD technology to the new 3D-based BIM technology. The benefits of using BIM are now so well-known that they don’t have to be re-hashed to convince firms to adopt BIM. After all, why would anyone be still using a typewriter when it’s so much faster and easier using a word-processing application on a computer? In the same way, BIM is universally acknowledged as the way forward for AEC firms when it comes to designing and constructing buildings. However, when it comes to the ongoing operation and maintenance of those very buildings, the unequivocal faith in BIM is not yet there, and there are only a very limited number of resources—both online and in print—for facilities managers interested in learning more about this technology and applying it to their work. AECbytes itself has just published one article in the last several years on this subject (“BIM for Facilities Management”, Sep 2011), and even this was mostly about the software rather than about the process. The book BIM for Facility Managers is intended to fulfill precisely this gap. 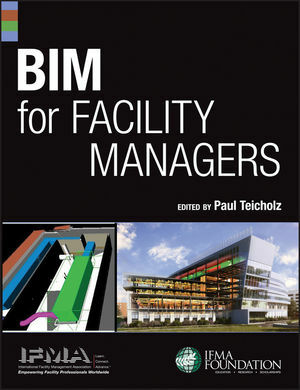 Edited by Paul Teicholz—one of the most active, respected, and well-known academics in the AEC technology industry who founded Stanford’s CIFE and served as its director for several years—under the aegis of the International Facility Management Association (IFMA), BIM for Facility Managers covers a lot of ground. It not only makes the case for the application of BIM to FM for owners, developers, and facilities managers, but also sheds light on the various aspects of implementing it in practice, such as the GSA (General Services Administration) guidelines for BIM in FM, the emerging COBie (construction operations building information exchange) standard that is especially geared towards BIM-based facilities management, some of the software that supports BIM/FM integration, and a set of six real-life case studies showing the processes and challenges involved when attempting to apply BIM to FM. The different chapters in the book are authored primarily by working professionals and researchers in the field, so the content strikes a good balance between what’s possible now, what’s being done, and what’s coming ahead. While the benefits of BIM implementation are obvious to anyone in the building industry conversant with it, there is still a case to be made for it for those not very familiar with it in the FM field, and the book makes this well. It cities examples such as the oft-quoted 2004 NIST study that highlighted the steep cost of interoperability in the AEC/FM industry, and actually calculates and presents an approximate ROI for undertaking BIM-FM integration, which makes the case for it even stronger. It also devotes an entire chapter to discussing the legal and contractual issues related to the use of BIM models provided by the architect or contractor for facilities management, important in any professional field governed by contracts such as AEC/FM. It addresses both liability and intellectual property concerns such as the accuracy of what is in the model, its contractual status, who owns the model, if there will any increase in risk because of the use of BIM, and so on, all of which would be of prime concern to the owner of a facility considering BIM-FM integration. For owners looking to move forward with using BIM for FM, there is an extensive overview of the GSA guidelines for this field, which have been developed over several years and represent the most comprehensive approach to linking BIM to FM requirements. These guidelines have been implemented on actual projects, three of which are presented as case studies, helping owners to better understand how to go about their own implementations and what are the issues and challenges they are likely to encounter. Additional understanding is enabled by a chapter on COBie that provides a detailed description of what exactly this standard is and how it can be used to collect building data from a BIM model for input to an FM system. As of now, COBie is the only standard specifically developed for BIM FM integration and it is important for anyone in the FM field to have a working knowledge of it. BIM for Facility Managers also includessix real-life case studies that document BIM-FM integration for a variety of public and private owners, giving us a good idea of the current state of the art of the application of BIM to FM. Given that the field is still relatively new, the case studies are more of a record of the difficulties and frustrations that accompanied these early efforts than a compilation of “success stories” per se. They provide us with a candid picture of what it’s really like out there. But rather than be discouraging, the book makes it clear that these kinds of “growing pains” are bound to be there in any field, and the many benefits that await the field of FM when the BIM-FM integration becomes stronger are compelling enough to make us persist in this endeavor. Overall, BIM for Facility Managers succeeds in its intent to “provide a thorough and consolidated guide for professionals and students in the building industry to learn about the significant owner benefits that can be obtained from BIM-FM integration and how to achieve these benefits.” It is a must-have resource that anyone working or studying in the AEC/FM industry should have readily available to refer to, as it can provide an indepth understanding of the essential underpinnings of the field that would be difficult to find elsewhere. With several case studies of BIM-FM integration on GSA and other public and private projects, the book provides a good mix of the theoretical with the practical, of not just what you need to know but also how to apply it. It is important to note that BIM for Facility Managers is nota guide to BIM in and of itself or a guide to FM per se, or even about FM technology in general—there are so many FM-specific applications for various tasks such as space allocation, asset management, inventory control, etc. It assumes a working knowledge of BIM and of FM, and is most likely to benefit FM professionals (and students) who know about the basic premise of BIM and would like to apply it in their work (or research) to improve it. The only really major quibble I had about this book was that all the six case studies that were presented were ones in which Revit had been used as the BIM application. It would have been useful to see how FM was being done even with the use of other BIM applications like ArchiCAD and Bentley AECOsim, and this one-sided view was quite disappointing, especially given the focus on interoperability and the open standard, COBie, for BIM-FIM integration. Also, it would have been helpful to include a “cheat sheet”— a quick reference guide— summarizing what FM professionals need to do to take advantage of BIM in their practice. What do they need to ask for? What software should they use based on the BIM application generating the model? And what are the main steps involved? While the book provides an extensive amount of background and information on BIM-FIM integration, distilling this to specific do’s and don’ts—admittedly far from easy—would, I think, be invaluable to speed up the application of BIM in FM. And finally, a really minor issue: there are several references to the colors used in charts and diagrams while explaining concepts, but these cannot be seen because of the black-and-white format of the book. Hopefully, this error can be resolved in a future edition of the book. For now, BIM for Facility Managers does a good job of reminding us that although the field of BIM in FM is relatively new and that the software and standards that are needed for BIM-FM integration are still in the early stages of development, we can speed up the development and implementation of the technology by learning everything we can about it. It is only through the sound understanding of an underlying concept that new ideas based on it can be created and executed; similarly, we will see the use of BIM extending to FM only after the FM industry has fully understood the theoretical underpinnings and practical applications of the technology, both of which are addressed in this book. The current status and future outlook of the application of BIM in the field of FM (facilities management), including the FM capabilities of FM:Systems, ArchiFM, Bentley Facilities, Onuma Systems, and EcoDomus. An indepth review of The BIM Handbook, which presents the technology and processes behind BIM and how architects, engineers, contractors and sub-contractors, construction and facility owners can take advantage of the new technologies..